Doctors had planned to wake the 65-year-old comedian on Saturday. Gallagher's promotional manager says the comedian had two stents replaced after collapsing Wednesday before a performance at a bar in Lewisville, a Dallas suburb. Doctors have decided to wait before bringing the comedian Gallagher out of the medically induced coma he was put in after his heart attack last week in Texas. Doctors had planned to wake the 65-year-old comedian on Saturday. But his promotional manager, Christine Scherrer, says he was trying to wake on his own. Doctors are keeping him sedated because they want to wake him slowly. She says they may try Sunday. Scherrer says the comedian had two stents replaced after collapsing Wednesday before a performance at a bar in Lewisville, a Dallas suburb. He had a minor heart attack last March after collapsing while performing in Minnesota. 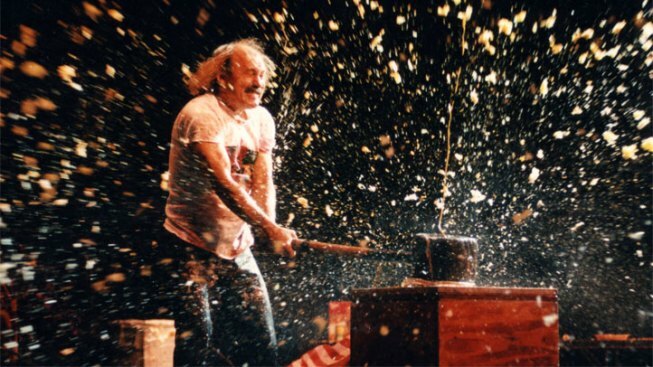 His full name is Leo Anthony Gallagher, and he's best known for smashing watermelons with a sledgehammer.